Alysia Montano, the fifth place finisher in the 800 at the 2012 London Olympics, Brenda Martinez, the bronze medalist in the 800 at the 2013 World Championships and Molly Ludlow, the silver medalist in the 800 at the 2011 NCAA Outdoor Championships were left off the team. EUGENE, Ore. — Until Monday’s 800 meter final at the U.S. Olympic Track and Field Trials, 27-year-old Yale graduate Kate Grace was a largely unknown athlete who had never managed to secure a podium finish at a national meet. Until Monday night, Grace’s best result was a fourth-place finish at the 2013 USA Outdoor Championships. Alysia Montano, the fifth place finisher in the 800 at the 2012 London Olympics, Brenda Martinez, the bronze medalist in the 800 at the 2013 World Championships and Molly Ludlow, the silver medalist in the 800 at the 2011 NCAA Outdoor Championships, were strongly favored to make the Olympic team going to Rio de Janeiro this summer. Through the first 650 meters of the race, everything went according to plan for Montano, Martinez and Ludlow, who had collectively posted the three fastest times in both the preliminary rounds leading up to the final. 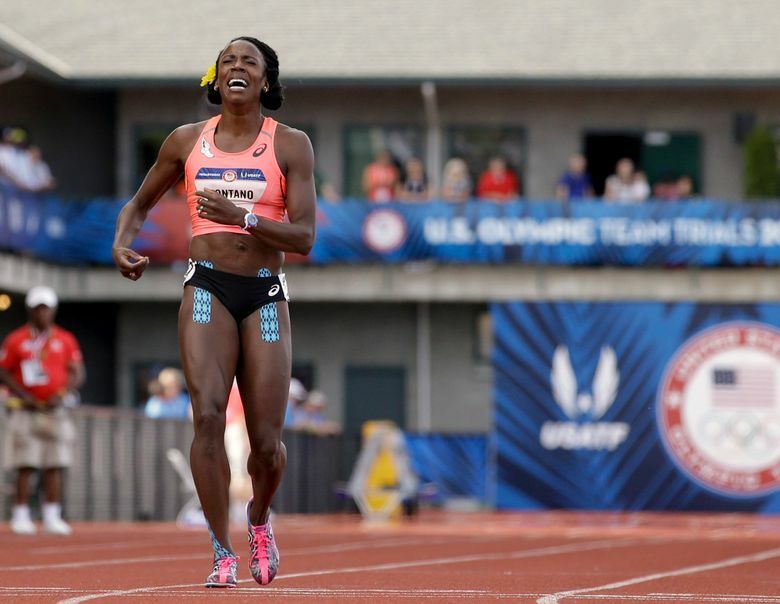 Alysia Montano was tripped up with 150 meters to go in the women’s 800m final at US Olympic track and field trials. The incident likely cost her a spot on the Olympic team. That’s where things went awry. Around the final 150 meters, with the leading six runners all bunched into a tight pack, Montano made a move to the outside that proved to be her undoing. Somehow, she and Martinez got tangled up. Both tripped. Montano tumbled, and Martinez lost all momentum. The lingering image from the cameras that captured the moment showed Montano on all fours, desperation, despair and defeat reflected in her eyes as she watched her opponents streak to the finish line without her. This was supposed to have been her race. Her chance to go back to the Olympics and win a medal outright after finishing fifth in London — only to find out in 2015 that two of the three women who had finished ahead of her were Russian athletes who had been implicated in a World Anti-Doping Agency report. WADA recommended that Mariya Savinova and Ekaterina Poistogova, who finished first and third, respectively ahead of Montano in 2012, should be banned from the sport for life. In theory, this meant that Montano should, in due course, get a medal for her performance in London. But all that was on her mind Monday was securing a trip to Rio. In an instant, her big chance was erased. As Montano sobbed and tried to finish the race, Grace made a late move from the inside, surging past Wilson to win her first career U.S. championship and set a new personal best of 1 minute, 59.10 seconds. Wilson crossed the line next, clocking 1:59.51, and Chrishuna Williams from the University of Arkansas finished third in 1:59.59 to cement spots on the Olympic team. Ludlow finished fourth, in 1:59.63, but also missed out on a berth to Rio. Martinez trotted to a seventh place finish. Afterward, Montano was dejected, unsure what had caused her to fall. Because of some jostling on the inside in earlier races, she said she’d tried to stay on the outside of the pack, a change from her typical strategy of running close to the rail. “Brenda flipped out somehow over there. She jumped out to the side. Whatever happened with Brenda started the whole domino effect. I thought I was in a safe position because I started so far out,” Montano said. Martinez, at least, will have another shot at making the Olympic team — she is scheduled to run in the women’s 1,500 on Thursday. For 30-year-old Montano, however, this was her only chance. Grace, the unlikely victor, will be going to her first Olympic games. On a day where Montano switched to the outside to keep from being jostled, Grace took her coach’s advice and did the opposite.